Since I am born in a little village in China, I grew up with a rarely touched natural environment. Years passed, the environment in China has suffered alongside the fast economic growth. Many species of insect are already in danger. One example could be the fireflies. I remember the fireflies in my village, in the night you will see them in groups. But now the beautiful scene of them will not appear anymore. 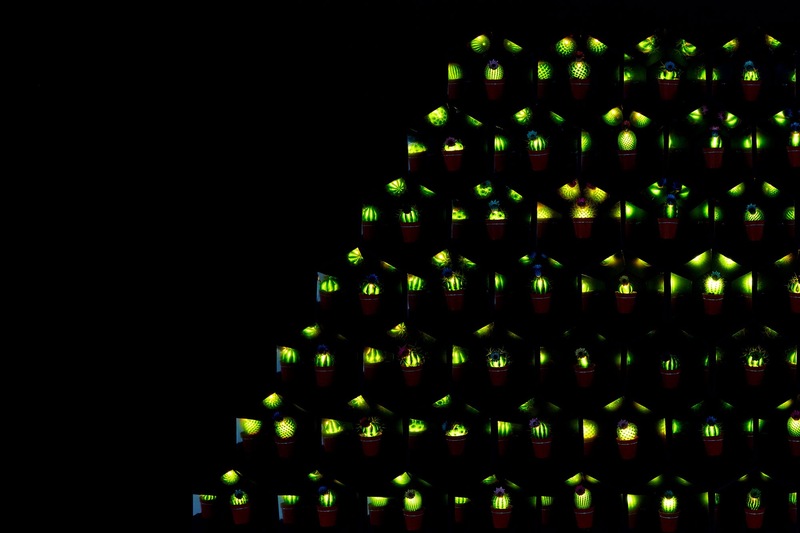 In my graduation project, I tried to symbolize the shining fireflies by a special light installation. I choose the cactus as the container of the light. One reason for this choice is that fireflies and cactuses are both natural creatures. A second reason is that both of them seem to prefer being untouched. Trying to touch or catch the fireflies makes their existence in danger, while a cactus protects its main body with spines. Beside this poetic concept, I also left the question to the viewer, asking if this is a destruction to nature or not. Firstly, I have to poke a little hole in the cactus to construct the LED lamp in the cactus. Some people think this is a torture of the cactus, which is also what I thought in the beginning. Hence I decided to ask a cactus specialist for help. Our collaboration with the specialist went well. I have learned a lot about the growth of a cactus and that the little hole in the cactus won’t let the cactus die. Actually, there is already an existing technique to put fake flowers on the cactus, and then using special sand to cure the wounds. I have tried a variety of led lights as well as some new designs about the relative positions between the light and the flower. I have thought about using natural energy. For example, solar energy, the energy from the potting soil or the energy from the plant itself. But those systems will be much more complicated and the mechanism will be too big for one cactus. It also wouldn’t give enough energy to light the cactus up. The flower is a camouflage of the light, but it should not be too big. It has to be so small that it would not block the light. To ensure a small power source, a button cell was chosen. This ‘LED flowers” are handmade and it requires a lot of precision.